Chord progressions are a succession of chords played one after another and during a specified duration. On this page, you’ll find the 10 most popular chord progressions in jazz, a list of songs that use similar chord progressions and the jazz guitarists who recorded these songs. In this lesson you will learn how to recognize these progressions from a Roman numeral standpoint, allowing you to quickly transpose them to other keys, as well as two different ways to comp through each progression on the guitar. It’s important that you learn to recognize these classic chord progressions and that you practice improvising over them, so grab your axe, turn up your amp and let’s dig into these 10 Must Know Jazz Guitar Chord Progressions! The 2 5 1 progression is without any doubt the most popular chord progression in jazz. I’m not going to give you a list of songs that use this progression since a jazz standard without a ii V I is almost unthinkable. 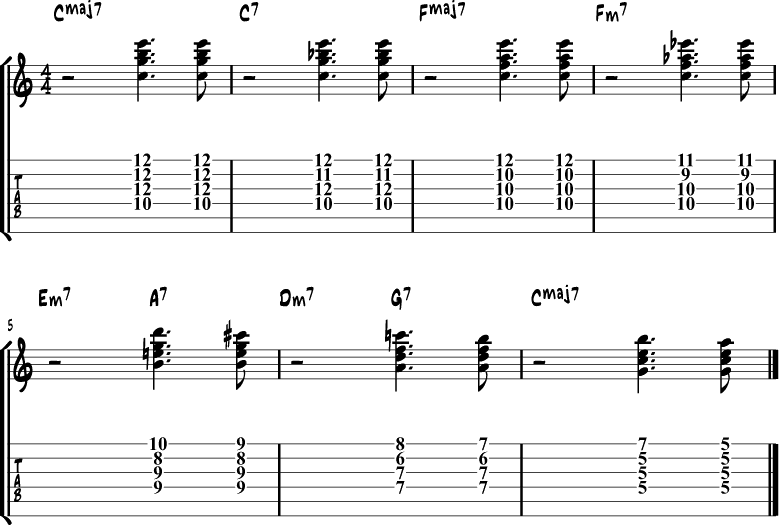 Some jazz standard chord progressions are nothing more than a series of II Vs. It can be found in countless tunes, in all 12 keys, and with many different permutations, both rhythmically and harmonically. For this reason, it is the best place to start when working on solidifying and expanding your jazz guitar progressions repertoire. Btw, the % symbol means you have to repeat the chord of the previous bar. This chord progression is the first A of a Rhythm Changes. Rhythm changes are a kind of chord progression that use the same chord changes as ‘I’ve Got Rhythm‘, a song written by Gershwin in 1930. People started using this progression to jam on and so many different melodies came into being that use the same chord changes. Built around the I-vi-ii-V progression, with a slight variation between the first and second two-bar phrases, this chord progression can be deceptively simple. 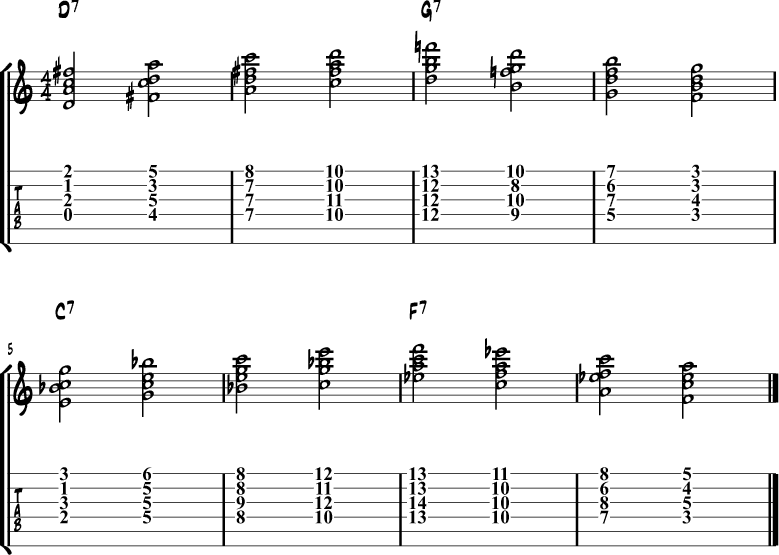 This is why a lot of guitarists don’t dig deep when exploring this progression. But, for those that do lift the hood and explore these changes with a bit more detail, you can learn new and creative ways of outlining these often-used chords, taking your Rhythm Changes comping to new levels of creativity. 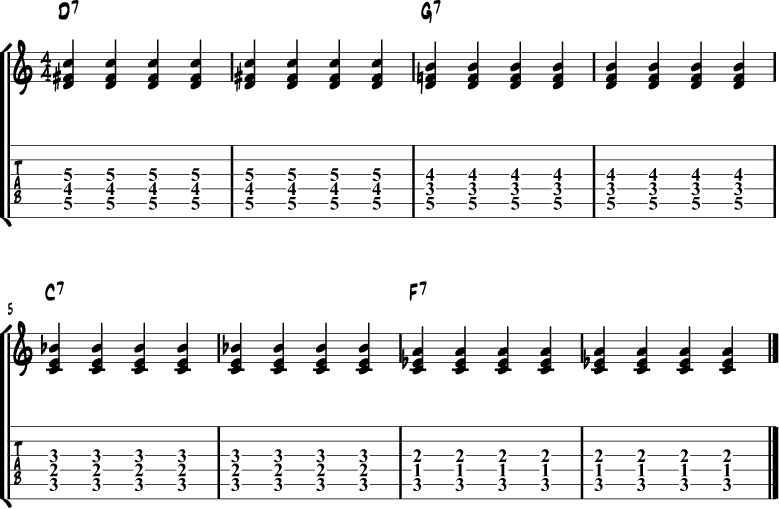 This is also a very common jazz chord progression. Used in tunes such as “How High the Moon” and “Tune Up,” descending major 2-5-1s are a commonly used harmonic device that can prove to be kind of tricky when first learning to navigate these chords. The chords start in the key of C major. They modulate to Bb major in the 3rd bar. They modulate again in the 7th bar, this time to Ab major. When faced with descending harmonic patterns such as this, many of us simply repeat the same chords down two frets for each new key. While this can work, more advanced players will find ways to ascend up the neck as the chord progression descends, providing a nice harmonic contrast during these chords. 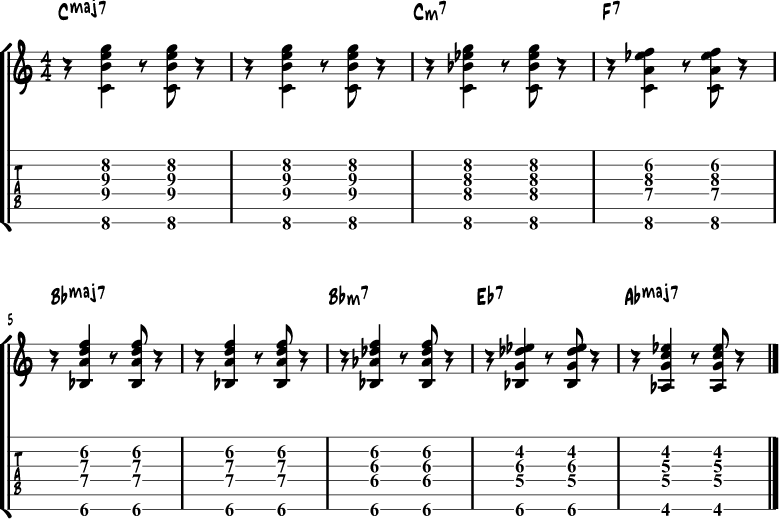 Heard in tunes such as “Cherokee,” the use of diminished 7 passing tones to connect the Imaj7 and iim7 chords, as well as the iim7 and iiim7 chords, in any chord progression is a commonly used and important harmonic device that can spice up the playing of any jazz guitarist. 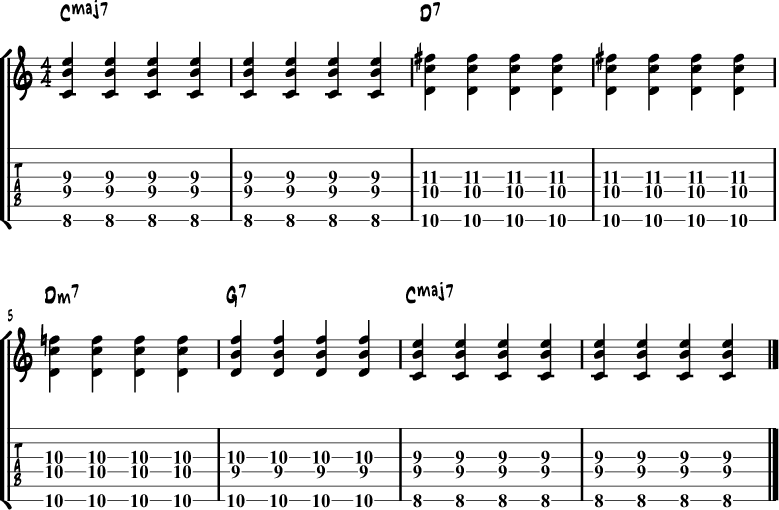 Dim7 chords not only add harmonic tension to this progression, but the chromatic bass line helps to build tension, which is then resolved to the iim7 and iiim7 chords in the following downbeats. 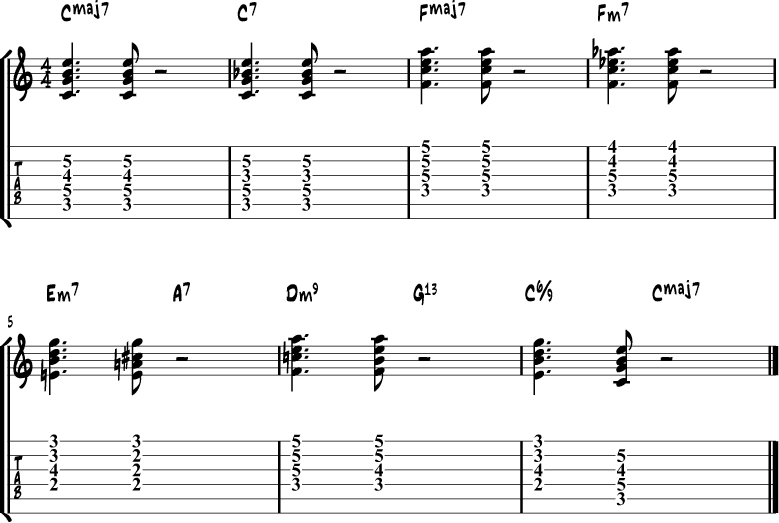 These chords, which feature the cool-sounding and fun to play II7 chord, are mostly associated with the classic Ellington track Take the A Train. The movement from Imaj7 to II7 to iim7 is one that you will see in many different jazz guitar tunes, including the classic Bossa Nova track The Girl From Ipanema, and is therefore worth working on from both a comping and soloing standpoint. For anyone that has played the blues, you know that the movement from a I chord to a IV chord is a commonly heard sound in the jazz guitar idiom. While you may be most familiar with this progression from a jazz-blues standpoint, you can also apply this progression to a major key situation such as the one seen in the examples below. 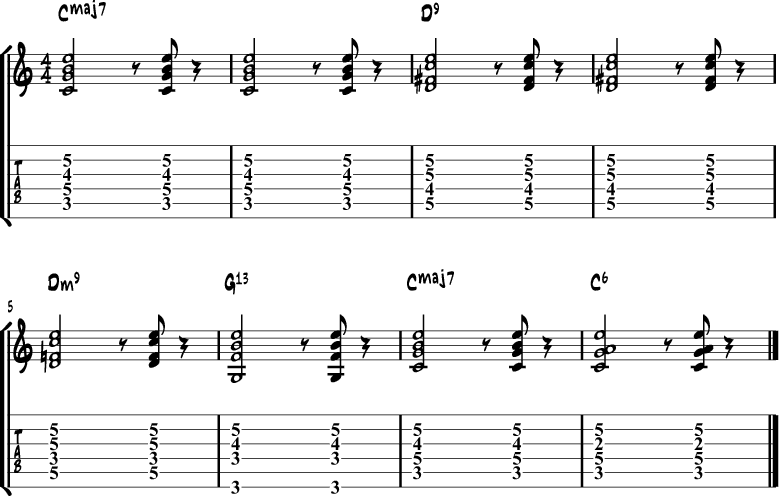 Used by countless jazz composers and improvisers, as well as many pop musicians such as the Beatles, the IV (major) to iv (minor) harmonic movement is one that every jazz guitarist needs to have under his fingers from both a comping and soloing standpoint. The key to learning to play and hear this progression is the movement from the IVmaj7 to the ivm7 chord. As we saw earlier, Rhythm Changes is a tune that is full of classic sounding, and must-know, chord progressions. Based off of the cycle of 5ths, the bridge to Rhythm Changes features four 7th chords moving up by a 4th with each new chord in the progression. Though there are only four chords, these changes can be tricky to master, and therefore are worth exploring. Just like its major-key cousin, the minor ii V I progression is found in countless tunes from many different composers and improvisers. Featuring the ever-tricky 7alt chord, this progression can be tougher to master than the major-key version we saw earlier, which is why it’s important to continue to develop your minor ii V I vocabulary even for more experienced players. 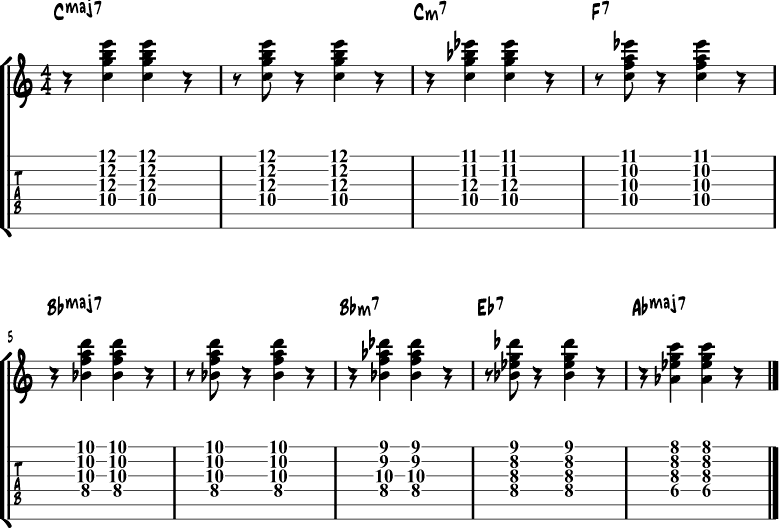 Heard in the classic tune “Stray Cat Strut,” this minor-key turnaround is one that every jazz guitarist should have under his fingers. With a distinctive bass line, simple yet effective harmonic movement, and a swinging feel, these four chords can add spice to any plain minor-turnaround. Superbly comprehensive guys. Thank you so much. Look forward to learning from the lessons. hi there, i am wondering in the sixth progression ( I to IV), which i suppose the iim7 acts as a passing chord so i just let it be.. I was thinking if it was a mistake or maybe it’s possible both ways, because it appears as I iim7 V7 IV and instead of G7 the progression plays C7 which will be I7 . I will be glad if someone can resolve my answers or otherwise if an error exists which one is the correct way of playing that progression? Wow, oh, wow Dirk. Thanks again!!! I purchased your “Easy Guide to Jazz Guitar Chords” PDF and am working through that book and have noticed the same inconsistencies. Most of the time the one chord is denoted with a “I” and sometimes with a “i”, e.g., pages 162 and 163, respectively. Would you mind clarifying when you have a chance? Hi Jonny, at the bottom of the lesson is a “Print & PDF” button. Guys…I am thrill by the work you post and give to any of us! the V7 chords are actually the IV7 chord listed and in the progressions. curious if that is a typo or a “chord substitution” i read about. i’m a beginner. Hi WB, Cm7-F7 is the ii V of Bbmaj7. If you count up from Bbmaj7 you’ll notice that the F7 comes on the 5th step. The same goes for the following ii Vs.